Alec Baldwin, continuing his quest to make enjoying any of his work impossible, has just appeared on Megyn Kelly Today. Though very much concerned that other talk show hosts are letting their programs become “grand juries” on sexual harassment, Baldwin is apparently very cool with turning America’s waking nightmare of a government into breezy anecdotes. Watch on as he discusses his Trump impression and the very funny revelation that Melania “loves” the actor’s version of the walking goiter she calls husband. There’s nothing wrong with Baldwin talking about the response to his famous take on the president, of course. Instead, it’s the light-hearted, toothless patter of he and Megyn “Inexplicably Rehabilitated” Kelly celebrating the first lady’s approval of his ineffective satire that grates. Whether or not Melania Trump, as Kelly says, “has a good sense of humor,” her having an opinion opposite of the president’s, who supposedly hates Baldwin’s impression, is hardly redemptive. Kelly, Baldwin, and the audience’s smiling and laughter comes across like self-satisfied group reassurance. 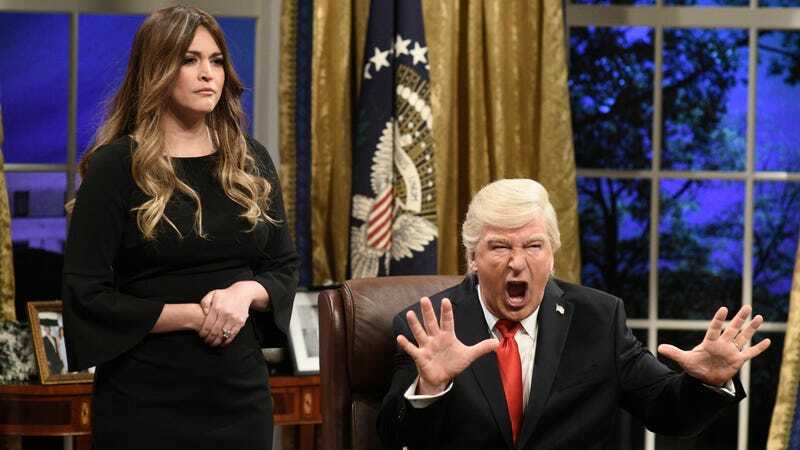 Saturday Night Live’s watery comedy didn’t stop Trump’s election (more likely, it helped his campaign) and it’s unlikely to do much to change things now. Or maybe it’s just hard to want to hear Baldwin much at all in this particular moment. His commentary on recent Hollywood news is mixed enough shows that his industry insight is either useless or harmful and, though he’s clearly no fan of Donald Trump, knowing that Melania likes the particular way he mocks her husband isn’t exactly great, politically subversive commentary.